1st 5 Driving lessons £15.00 each in Hackney, HURRY !! Start driving lessons from as little as £15.00 an hour in Hackney and we can even offer a driving test at short notice! Look no further call now to book. You won´t find cheap driving lessons in Hackney that give you a better service or have a better pass rate. We provide affordable driver tuition in the Hackney area. Our teaching methods are continually updated as set out by the Driving Standards Agency (DSA) in order to provide the best tuition possible in modern, fully equipped cars with dual controls and we offer competitive prices on our driving lessons in and around Hackney. Finding the right instructor for you is not always an easy task but driving lessons with Time To Pass Driving School are conducted in a friendly, patient and professional manner and we find that even the most nervous pupils are quickly put at ease allowing them to get on with learning to drive. So whether you are a new driver looking to get behind the wheel for the first time, or have already had driving lessons and just need some additional confidence before taking your test, call 07512 345672 today and get on route to your independence. 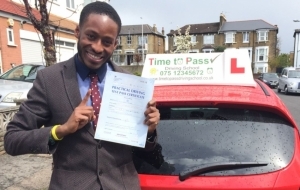 Take your driving lesson in hackney with Time To Pass Driving School. Driving lessons at any time to suit you, collect you from home, college or work. Can be taken in 1hr or 2hrs driving lessons. Driving lessons done can be week by week or semi intensive. call us, 075 12345672 today and get on route to your independence.